Mud Creek Falls is one of the most spectacular waterfalls in California. 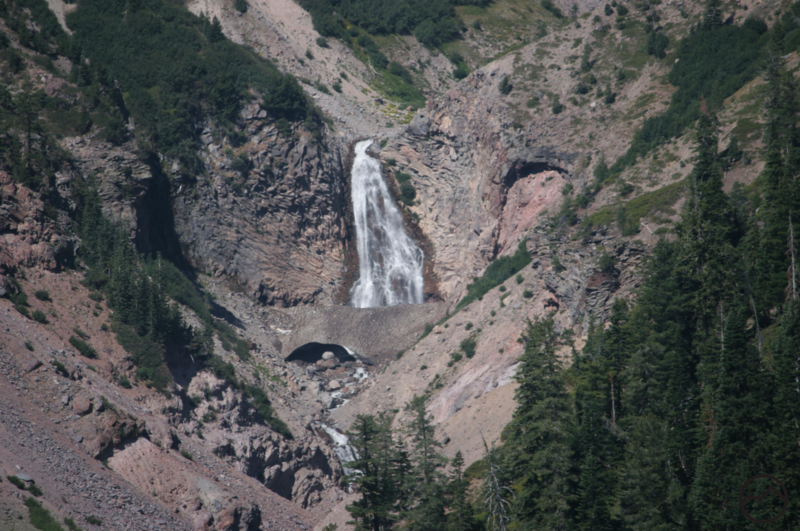 Fed by both glaciers and springs, it has the highest volume by far of any of the falls on Mount Shasta. Where Whitney Falls is full of grace, Mud Creek is full of fury. The high volume of water erupts over the edge of a band of hard, erosion resistant rock and thunders down into a narrow chasm. The bulk of the water flowing over the falls plunges downward in a classic, linear waterfall while a smaller, yet still significant, amount spreads out in a lacy series of cascades bouncing down the face of the rocky cliff. It is a tremendous sight and worthy of far more attention than the waterfall receives. Perhaps Mud Creek Falls languishes in relative obscurity because it is nearly overshadowed by the epic scope of its surroundings. Tucked into the bottom of 1,500 foot deep Mud Creek Canyon, the falls are dwarfed by the tremendous size of the canyon. Mud Creek Canyon itself appears diminutive when compared to the mighty cone of Mount Shasta, which rises overhead. Volcanic spire after spire march up Sargents Ridge, casting their shadows deep into the canyon. Near the summit, the Konwakiton Glacier clings to the mountain’s rocky slopes. Melted water from the glacier is the initial source of Mud Creek. The entire scene, taken as a whole, is mesmerizing and it is easy to see why such a magnificent waterfall as Mud Creek Falls is lost amidst the grandeur of the mountain.